We are the manufacturer of the aluminum pulley. A 22 mm dia. Aluminium pulley, moves in metal bracket with mounting base plate of 35mm length provided with fixing holes. Our company is a very well renowned name of the industry for providing a high quality range of Aluminium Pulley to our shoppers. These are designed by utilizing finest quality material and advance technology. Our products are widely used in various sectors. These are attainable at leading market prices. We are one of the leading manufacturer and supplier, exporter of Aluminum Pulley supported by well qualified professionals, we produce and extensive array of quality made Aluminum Pulleys for different different usage of it. 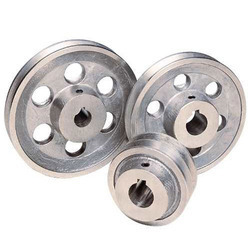 This range of Aluminum Pulley is provided in wide range of models and sizes to meet varied requirements of customers. We are manufacture of specialized aluminum timing belt pulleys in all sizes with high quality or as per tolerance standards. We request genuine buyers/importers to please contact us. Complete with side covers and allen cap head screws, Hex nuts etc. Thoroughly tested for balance and concentricity. We are offering an amazing quality of Aluminum Pulley which is manufactured in varied sizes ensuring best performance. These are fabricated with either crown face, bare face and rubber and are lagged with herringbone grooves. With our expertise, we ensure its smooth surface and surface bond. We are manufacturer and supplier of very best quality Aluminium Pulleys.